When does a feature become a liability? That's what we were wondering as we studied the specs for Nikon's latest super-zoom Coolpix. With a range to 2000mm, we wouldn't expect to be able to either hand hold the camera or even find the subject to compose it in the viewfinder. Coolpix P900. More to it, fortunately, than the zoom range. Fortunately there's no obligation to use the full zoom range, although with a tripod and that optic pointed at the moon in Moon mode, you might have a lot of fun. Just looking at a few of the other specs, we sniff a few trending features. Like built-in WiFi and NFC to use a smartphone for remote control and image sharing. Or built-in GPS with Nikon's Point of Interest database to identify major landmarks, particularly handy for travelers. And, apart from the ever-useless Scene modes, there are some creative modes that promise to amaze your friends. Like portraits that look painted. Moon Mode at 83x optical zoom to capture detailed images of the moon; Highlight a single color in a black & white photo; Create portraits that look like paintings and illustrations; Combine multiple exposures one high dynamic range image. Business End. Articulated screen, shooting controls. The Coolpix P900 will be available in Black for a suggested retail price of $599.95. The camera will be available for purchase in April but is available for preorder from Adorama and B&H now. 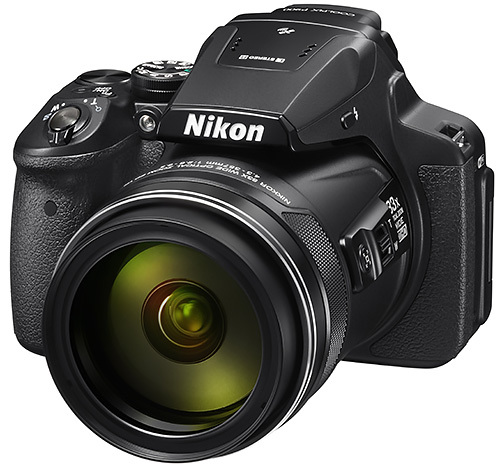 MELVILLE, N.Y. -- Nikon Inc. has announced the Coolpix P900, a camera that offers an unprecedented and incredible 83x zoom along with superior performance. This exciting long zoom option provides users with incredibly sharp Nikkor optics and a 166x Dynamic Fine Zoom range capable of reaching previously unimaginable distances. In addition to its unrivaled zoom power, the 16-megapixel Coolpix P900 comes equipped with an array of innovative features and advanced controls for capturing sharp and detailed images as well as Full HD video from afar. Such features include built-in GPS and the experience of Nikon Snapbridge, whereby users seamlessly shoot and share stunning photos from the camera to a compatible smartphone or tablet via built in WiFi(r)1 and Near Field Communication technology (NFC2). With its unbelievable zoom power, users can take close-up shots of a bird high up in the trees or capture the look on their child's face as they score their first goal from the sidelines. Additionally, the COOLPIX P900 combines user-friendly controls, creative features and fast performance, giving users the opportunity to explore their creative path regardless of their photography level or experience. "With its spectacular 83x zoom range, extensive list of innovative featuresand advanced controls, the new Nikon Coolpix P900 is the first Coolpix compact camera to ever offer this amazing zoom range and powerful features together in an easy-to-use package," said Masahiro Horie, Director of Marketing and Planning, Nikon Inc. "The Coolpix P900 will provide users with the opportunity to capture sharp images and video in rich detail near or far andto share their content with family and friends with confidence." The Coolpix P900 demonstrates the incredible capabilities of Nikkor optics by sporting a powerful 83x optical zoom (24-2000mm equivalent) Nikkor ED glass lens with the ability to reach 166x using Dynamic Fine Zoom and a superextra-low dispersion glass element, making this camera ideal for capturing sharp images and videos from extreme lengths. This feature-packed long zoom is equipped with a 16-Mp CMOS sensor and a high performance Autofocus system capable of shooting 7 frames-per-second (fps) to help deliver photos of fast moving sports in superb quality. Sharing these amazing photos has never been easier or more fun, as the Coolpix P900 allows users to seamlessly shoot and share photos from the camera to a compatible smartphone or tablet via built-in WiFi(r)1 and NFC2 connectivity. Whether shooting above a crowd or from the stands, users can easily and intuitively frame their subjects by using the camera's built-in electronic viewfinder with an eye sensor or high-resolution, Vari-angle 3.0-inch 921K-dot LCD. When sitting in the upper deck at a baseball game or taking photos of the family at a summer barbeque, the Coolpix P900's versatile controls and features makes it a great companion for every shooting scenario. Users can utilize the camera's snap-back zoom button to effortlessly frame subjects when shooting super-telephoto shots, while the Side Zoom Control button's position helps to combat camera shake. Additionally, the camera has an intuitive control layout, with the Fn (function) button providing fast access to frequently used functions, plus the Command Dial and Mode Dial allow users to quickly apply or adjust settings with just one hand. 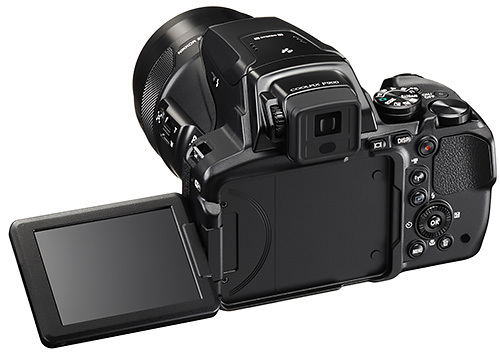 The COOLPIX P900 also features Manual (spot), Manual (normal) and Manual (wide) AF Area Mode options that can be selected in accordance with the size and position of the primary subject. Taking great action shots is easy with the super-fast Coolpix P900, as it boasts a speedy shooting lag time of approximately 0.12 seconds at the maximum wide-angle position and approximately 0.75 seconds at the maximum telephoto position. This rapid performance allows users to capture clear back-to-back shots of a runner dashing toward the finish line or a baseball player headed toward home plate with rich detail. What's more, the camera incorporates the new Dual Detect Optical VR technology to help achieve the highest level of camera shake compensation available in a Nikon compact digital camera, equivalent to a 5.0-stop increase in shutter speed to help ensure sharp photos. For those looking to expand their creativity, the Coolpix P900 offers fun and user-friendly features like Scene Modes, filter effects, special effects, Picture Controls and macro mode to help users not only find the best settings for nearly any environment, but allow them to add a personal touch to every image or video. Whether users are shooting a school play indoors or out on the slopes, the Coolpix P900 provides Scene Modes and filter effects that help achieve optimal results without missing a shot. Additionally, users can capture video in Full HD 1080p with stereo audio recording or use the camera's innovative Time Lapse feature to capture a beautiful sunrise or sunset video over the course of time. When recording video from afar, the Zoom Microphone function helps to enables clear recording of sounds from a variety of distances. Lastly, the Coolpix P900 makes it easy to document every vacation spot or outdoor adventure as the camera's built-in GPS and POI allows users to geo-tag images and view where those images were taken on a map. Nikon Snapbridge describes the experience of quickly and easily sending photos wirelessly from your WiFi(r)1 enabled Nikon dSLR, Nikon 1 or Coolpix camera to a compatible smartphone or tablet. Share your great photos on the go, even in remote locations or even use a smartphone or tablet to control your camera. See what the camera sees and take pictures-great for selfies and group photos that actually include you! The Coolpix P900 will be available in Black for a suggested retail price of $599.95. The camera will be available for purchase in April.